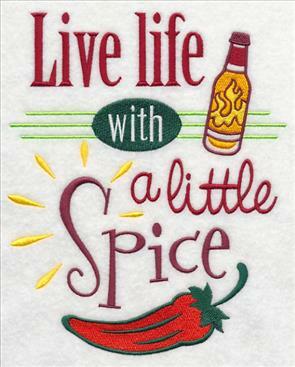 The kitchen is the heart of the home, and it's always fun to add a little spice to towels, table linens, aprons, and appliance covers. 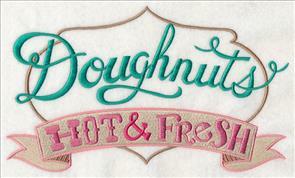 a fabulous variety of tasty new designs. 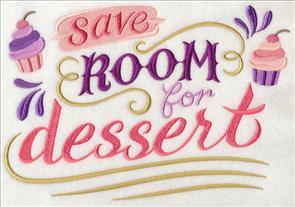 Each will bring robust and tantalizing flavor to your home. 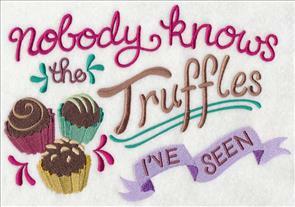 Scroll down the page to see them! 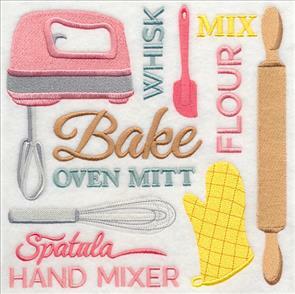 You'll also find dozens and dozens of other good-for-you designs that are the right size, shape, and theme for kitchen towels and placemats. 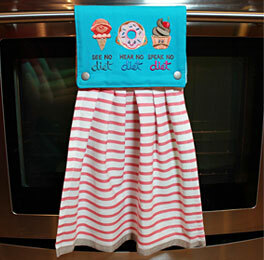 new designs on towels, and making this handy-dandy towel topper! 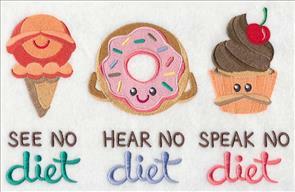 Sugary snacks encourage you to just say "no" to dieting. 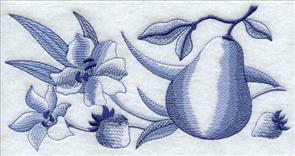 The design is filled in, and is a nice choice for tea towels or terrycloth kitchen towels. 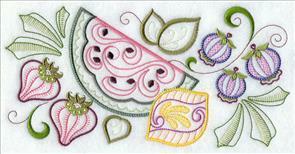 The design on the right is open linework, and is a perfect match for flour sack towels and other smooth, neutral fabrics. 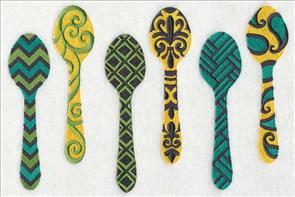 10.87" x 6.84" and 9.32" x 5.86"
11.75" x 6.31" and 9.42" x 5.06"
7.83" x 4.21" and 6.00" x 3.22"
These new designs are filled to the brim with personality and flavor! 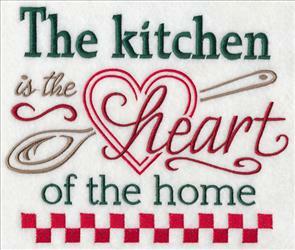 They're an excellent choice for aprons, placemats, tea towels, and framed pieces for your kitchen. 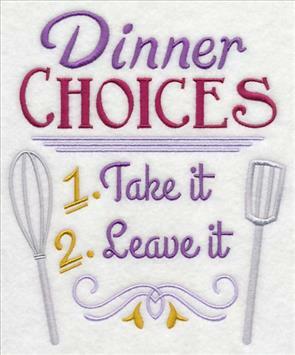 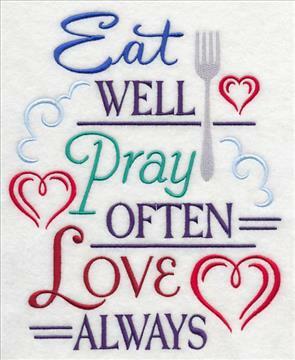 6.85" x 8.49" and 5.85" x 7.25" and 4.85" x 6.01"
Stitch these sentiments onto tea towels and aprons, and you'll get giggles and grins! 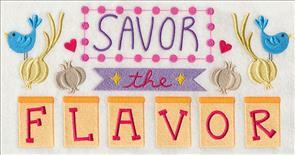 You can also make a fun message board for your kitchen following this example here. 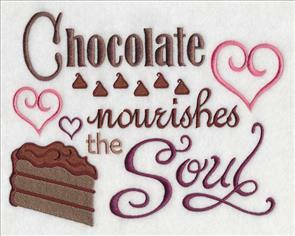 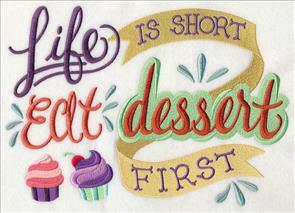 6.54" x 7.83" and 5.86" x 7.01" and 4.86" x 5.81"
Add these sweet sayings to placemats and mug rugs. 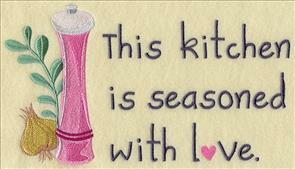 It'll add a loving look to your kitchen decor! 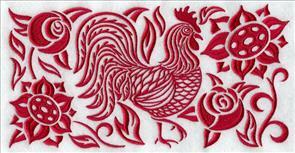 8.14" x 6.85" and 6.96" x 5.86" and 5.76" x 4.85"
Vintage-style chickens are reminiscent of hand embroidery. 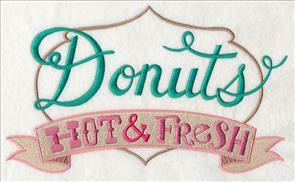 They have open areas and light stitches, and they're excellent on smooth, neutral fabrics. 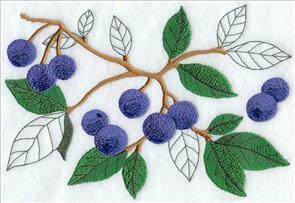 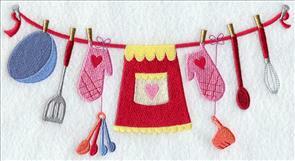 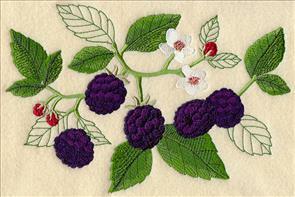 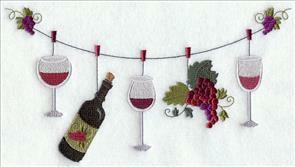 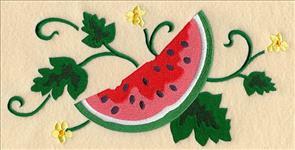 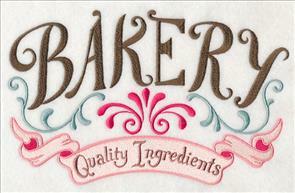 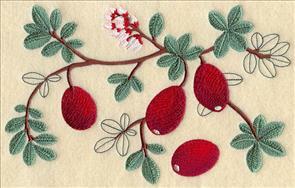 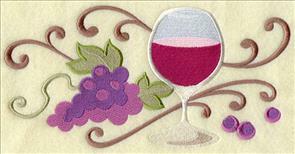 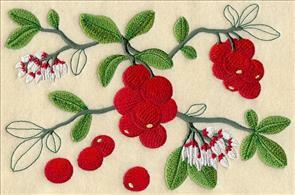 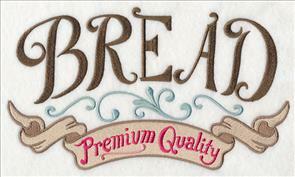 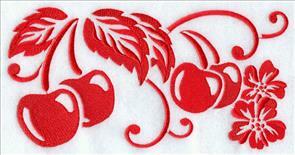 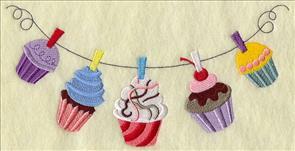 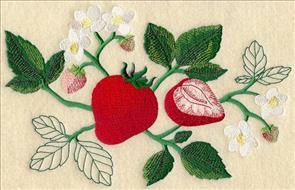 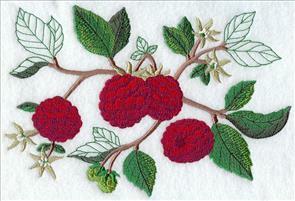 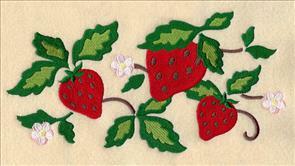 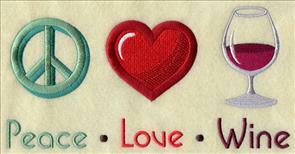 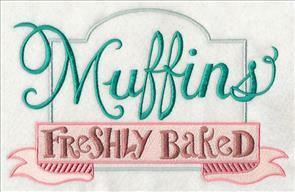 Embroider onto quilter's cotton or linen for placemats, tea towels, and curtains. 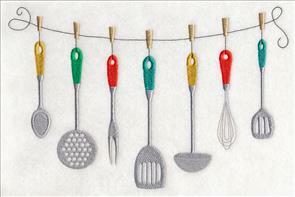 Kitchen utensils with colorful handles are a delightful addition to aprons and towels. 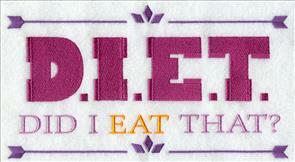 11.75" x 5.53" and 9.42" x 4.43"
10.47" x 6.88" and 8.90" x 5.85"
7.78" x 5.11" and 6.00" x 3.94"
Colorful squares are eye-catching and fun on aprons, placemats, and towels. 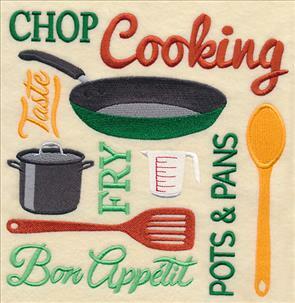 These two feature a variety of classic kitchen icons, paired with words and phrases. 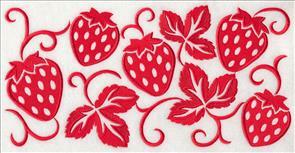 7.75" x 7.79" and 6.89" x 6.92"
5.84" x 5.87" and 4.86" x 4.88"
7.79" x 7.80" and 6.90" x 6.91"
5.87" x 5.88" and 4.87" x 4.88"
Does your palate prefer sweet things, or are you drawn to tasting wine? 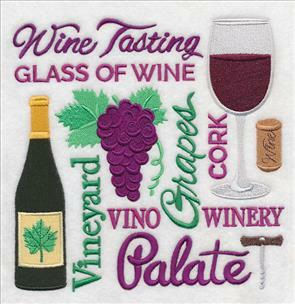 These designs are an excellent fit for tote bags for the grocery store (or wine market), as well as aprons and tea towels. 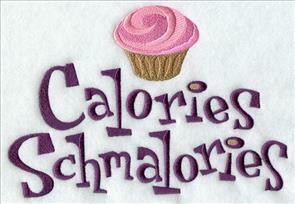 7.77" x 7.82" and 6.91" x 6.95"
5.84" x 5.87" and 4.86" x 4.89"
7.81" x 7.82" and 6.91" x 6.92"
5.86" x 5.87" and 4.86" x 4.87"
Wine lovers will enjoy a joke about keeping things "bottled up." 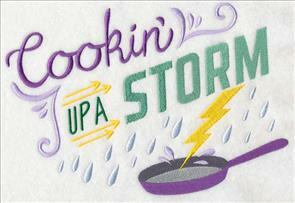 And, the "cookin' up a storm" design is an excellent choice for aprons! 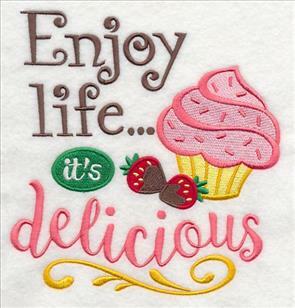 7.78" x 6.90" and 6.58" x 5.84"
9.96" x 6.85" and 7.82" x 5.38" and 6.85" x 4.71"
Good things come to those that bake, and these designs are an excellent choice. 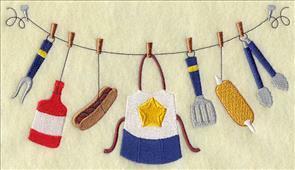 Stitch them onto appliance covers, tea towels, aprons, and table linens. 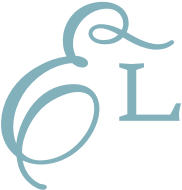 7.82" x 7.82" and 6.86" x 6.85"
5.86" x 5.86" and 4.86" x 4.85"
6.89" x 7.22" and 5.86" x 6.14"
4.89" x 5.13" and 3.69" x 3.87"
Colorful flatware is fun on placemats and picnic blankets. 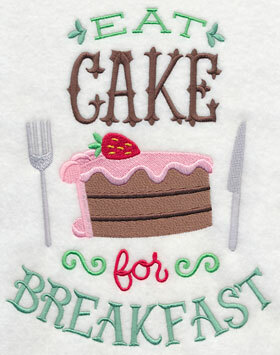 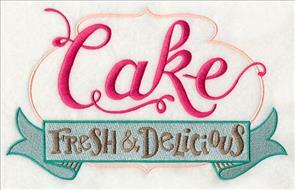 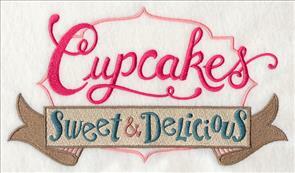 And, the cake-loving design is an excellent choice for pastry shops and placemats! 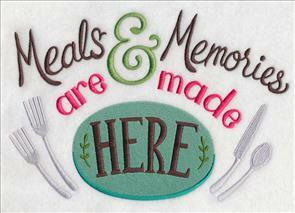 6.45" x 7.83" and 5.86" x 7.12"
6.86" x 8.71" and 5.87" x 7.45" and 4.83" x 6.13"
These designs let you make something unique and personal for your home. 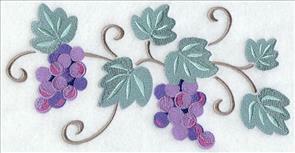 Choose colors that match your home decor and personal preference. 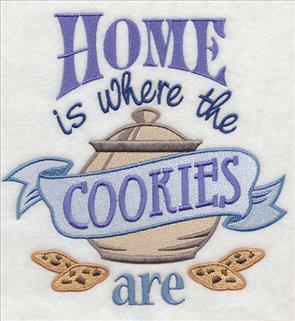 9.93" x 6.85" and 7.83" x 5.40"
9.98" x 6.90" and 7.81" x 5.40" and 6.85" x 4.74"
Add a cookie jar and sweet message to aprons and framed pieces for your kitchen. 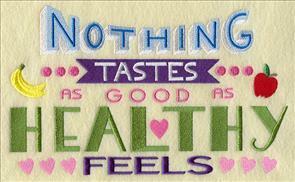 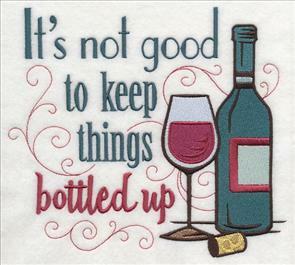 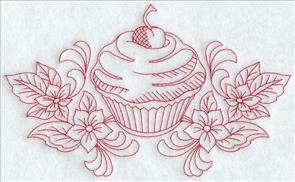 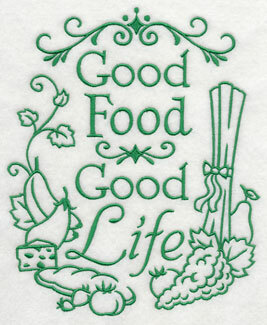 And, the Good Food Good Life design uses just one color, making it quick to stitch on tea towels. 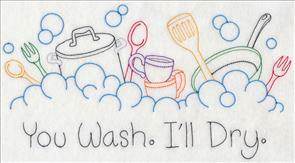 6.88" x 7.02" and 5.85" x 5.97"
6.51" x 7.83" and 5.86" x 7.05" and 4.85" x 5.83"
and towels! 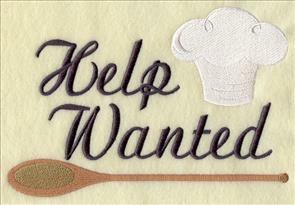 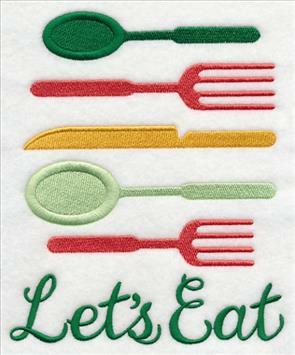 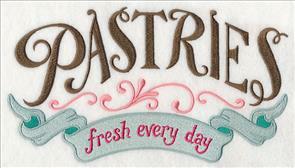 And, stitch an "easy as pie" message onto aprons and mini-quilts for your kitchen decor. 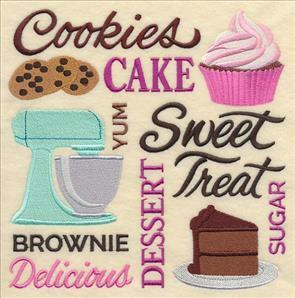 11.75" x 4.05" and 9.45" x 3.26"
7.83" x 2.71" and 6.01" x 2.08"
We know that you have an appetite for even more delicious designs, so we've hand-picked dozens and dozens more designs that are tasty choices for your kitchen. 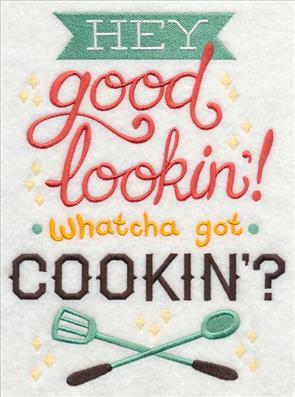 Scroll down the page to see the variety, and make something tasty for your kitchen today! 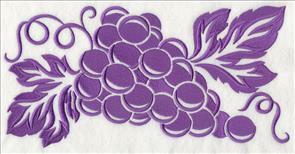 9.88" x 6.89" and 8.43" x 5.88"
7.80" x 5.44" and 6.87" x 4.79"
9.79" x 6.89" and 8.35" x 5.88"
7.81" x 5.50" and 6.86" x 4.83"
9.34" x 5.87" and 6.89" x 4.34" and 3.87" x 2.58"
9.32" x 5.87" and 6.84" x 4.31" and 3.88" x 2.45"
8.90" x 5.51" and 6.84" x 4.24" and 3.89" x 2.41"
9.39" x 5.64" and 6.82" x 4.10" and 3.87" x 2.33"
11.73" x 4.77" and 9.38" x 3.82"
7.79" x 3.17" and 6.86" x 2.79"
9.01" x 3.98" and 7.81" x 3.45"
6.86" x 3.03" and 3.87" x 1.86"
11.75" x 4.31" and 9.40" x 3.45"
7.80" x 2.86" and 6.87" x 2.52"
11.74" x 5.81" and 9.39" x 4.65"
7.79" x 3.86" and 6.86" x 3.40"
9.40" x 4.12" and 7.80" x 3.41" and 6.87" x 2.98"
9.40" x 5.07" and 7.79" x 4.19" and 6.86" x 3.69"
9.40" x 5.05" and 7.80" x 4.17" and 6.87" x 3.66"
8.69" x 5.86" and 6.84" x 4.62" and 3.86" x 2.62"
9.38" x 2.47" and 6.83" x 1.81"
Split Version: 3.38" x 1.80"
9.38" x 5.68" and 7.75" x 4.70" and 6.80" x 4.13"
9.41" x 4.72" and 6.00" x 3.16"
9.30" x 4.60" and 5.97" x 3.21"
11.75" x 2.78" and 9.40" x 2.22"
7.80" x 1.85" and 6.00" x 1.53"
11.75" x 3.01" and 9.40" x 2.41"
7.80" x 2.00" and 5.98" x 1.88"
Split Border: 3.09" x 1.54"
7.80" x 2.01" and 6.00" x 1.75"
11.75" x 2.82" and 9.40" x 2.26"
7.80" x 1.87" and 6.00" x 1.70"
Split Border: 3.27" x 1.43"
9.38" x 2.36" and 6.00" x 1.65" and 3.87" x 0.99"
9.37" x 2.37" and 6.00" x 1.79" and 3.85" x 0.98"
9.40" x 2.38" and 5.96" x 1.72" and 3.85" x 0.98"
9.40" x 2.41" and 6.00" x 1.69" and 3.86" x 0.99"
9.40" x 2.42" and 5.99" x 1.69" and 2.89" x 1.55"
9.40" x 2.38" and 5.95" x 1.53" and 3.00" x 1.52"
9.42" x 2.50" and 5.98" x 1.71" and 3.87" x 1.03"
9.41" x 2.74" and 5.98" x 1.93" and 3.87" x 1.13"
9.41" x 2.66" and 5.98" x 1.88" and 3.86" x 1.10"
9.41" x 2.24" and 5.98" x 1.51" and 3.86" x 0.93"
9.40" x 3.78" and 6.00" x 2.53" and 3.85" x 1.55"
9.41" x 3.09" and 6.00" x 2.04" and 3.86" x 1.27"
11.75" x 5.85" and 9.41" x 4.68"
7.80" x 3.88" and 5.98" x 3.45"
11.75" x 5.92" and 9.41" x 4.75"
9.41" x 4.67" and 5.98" x 3.25"
7.80" x 3.88" and 5.85" x 2.92"
4.85" x 2.41" and 3.86" x 1.90"
9.40" x 4.68" and 5.95" x 3.04"
9.41" x 3.93" and 7.81" x 3.25"
6.86" x 2.85" and 3.87" x 1.60"
9.39" x 3.66" and 7.79" x 3.04"
9.41" x 4.36" and 7.81" x 3.60"
6.86" x 3.15" and 3.86" x 1.77"
9.41" x 4.16" and 7.81" x 3.46"
6.86" x 3.04" and 5.26" x 2.33"
9.41" x 3.65" and 7.81" x 3.03"
6.82" x 2.65" and 3.87" x 1.50"
9.41" x 4.73" and 7.81" x 3.90"
9.42" x 3.46" and 7.82" x 2.87"
6.87" x 2.52" and 5.27" x 1.94"
11.75" x 4.28" and 9.40" x 3.42"
7.80" x 2.85" and 6.00" x 2.32"
11.75" x 4.29" and 9.40" x 3.43"
7.80" x 2.85" and 6.00" x 2.49"
11.75" x 4.30" and 9.40" x 3.44"
7.80" x 2.85" and 6.00" x 2.43"
7.80" x 2.86" and 6.00" x 2.30"
11.71" x 4.26" and 9.40" x 3.42"
7.80" x 2.84" and 6.00" x 2.45"
11.75" x 4.27" and 9.41" x 3.42"
7.80" x 2.84" and 6.00" x 2.40"
11.70" x 4.29" and 9.41" x 3.45"
7.82" x 2.87" and 5.99" x 2.35"
11.75" x 4.32" and 9.40" x 3.46"
7.80" x 2.87" and 6.00" x 2.51"
11.70" x 4.21" and 9.41" x 3.39"
7.81" x 2.81" and 6.00" x 2.16"
11.75" x 4.19" and 9.41" x 3.36"
7.80" x 2.78" and 6.00" x 2.38"
11.74" x 4.25" and 9.40" x 3.40"
7.81" x 2.83" and 5.98" x 2.17"
11.75" x 4.37" and 9.40" x 3.50"
7.80" x 2.90" and 6.00" x 2.30"
7.80" x 2.85" and 6.00" x 2.38"
11.75" x 4.23" and 9.40" x 3.38"
7.80" x 2.81" and 6.00" x 2.44"
11.75" x 4.27" and 9.40" x 3.42"
7.80" x 2.84" and 6.00" x 2.39"
7.84" x 2.87" and 6.00" x 2.48"
11.73" x 4.31" and 9.38" x 3.45"
7.82" x 2.87" and 6.00" x 2.42"
11.75" x 4.44" and 9.40" x 3.55"
7.80" x 2.95" and 6.00" x 2.50"
11.75" x 4.42" and 9.40" x 3.54"
7.40" x 2.79" and 6.00" x 2.50"
11.75" x 4.30" and 9.42" x 3.45"
7.80" x 2.86" and 6.00" x 2.32"
8.68" x 5.85" and 6.85" x 4.62" and 3.85" x 2.59"
8.93" x 5.85" and 6.82" x 4.45" and 3.85" x 2.50"
8.91" x 5.85" and 6.80" x 4.45" and 3.86" x 2.54"